The summer of 2012 has been one of heat, drought, rising food costs and global unrest. Food—affordable food—is essential to human survival and well-being. Take that away, and people become anxious, desperate, and angry. In the United States, food represents only about 13 percent of the average household budget, a relatively small share, so a boost in food prices in 2013 will probably not prove overly taxing for most middle- and upper-income families. It could, however, produce considerable hardship for poor and unemployed Americans with limited resources. “You are talking about a real bite out of family budgets,” commented Ernie Gross, an agricultural economist at Omaha’s Creighton University. This could add to the discontent already evident in depressed and high-unemployment areas, perhaps prompting an intensified backlash against incumbent politicians and other forms of dissent and unrest. 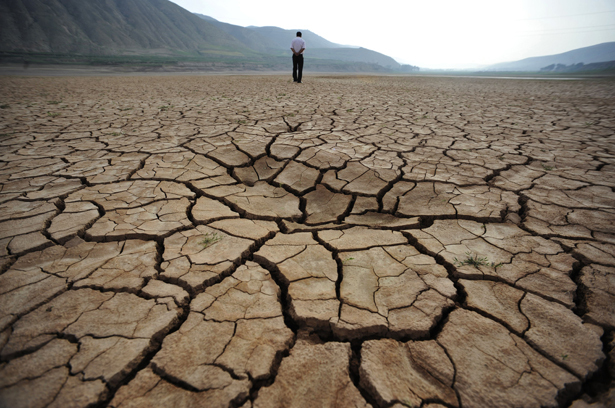 It is in the international arena, however, that the Great Drought is likely to have its most devastating effects. Because so many nations depend on grain imports from the US to supplement their own harvests, and because intense drought and floods are damaging crops elsewhere as well, food supplies are expected to shrink and prices to rise across the planet. “What happens to the US supply has immense impact around the world,” says Robert Thompson, a food expert at the Chicago Council on Global Affairs. As the crops most affected by the drought, corn and soybeans, disappear from world markets, he noted, the price of all grains, including wheat, is likely to soar, causing immense hardship to those who already have trouble affording enough food to feed their families. What happens next is, of course, impossible to predict, but if the recent past is any guide, it could turn ugly. In 2007–08, when rice, corn, and wheat experienced prices hikes of 100 percent or more, sharply higher prices—especially for bread—sparked “food riots” in more than two dozen countries, including Bangladesh, Cameroon, Egypt, Haiti, Indonesia, Senegal and Yemen. In Haiti, the rioting became so violent and public confidence in the government’s ability to address the problem dropped so precipitously that the Haitian Senate voted to oust the country’s prime minister, Jacques-Édouard Alexis. In other countries, angry protestors clashed with army and police forces, leaving scores dead. Those price increases of 2007–08 were largely attributed to the soaring cost of oil, which made food production more expensive. (Oil’s use is widespread in farming operations, irrigation, food delivery and pesticide manufacture.) At the same time, increasing amounts of cropland worldwide were being diverted from food crops to the cultivation of plants used in making biofuels. The next price spike in 2010-11 was, however, closely associated with climate change. An intense drought gripped much of eastern Russia during the summer of 2010, reducing the wheat harvest in that breadbasket region by one-fifth and prompting Moscow to ban all wheat exports. Drought also hurt China’s grain harvest, while intense flooding destroyed much of Australia’s wheat crop. Together with other extreme-weather-related effects, these disasters sent wheat prices soaring by more than 50 percent and the price of most food staples by 32 percent. As for the current drought, analysts are already warning of instability in Africa, where corn is a major staple, and of increased popular unrest in China, where food prices are expected to rise at a time of growing hardship for that country’s vast pool of low-income, migratory workers and poor peasants. Higher food prices in the United States and China could also lead to reduced consumer spending on other goods, further contributing to the slowdown in the global economy and producing yet more worldwide misery, with unpredictable social consequences. If this was just one bad harvest, occurring in only one country, the world would undoubtedly absorb the ensuing hardship and expect to bounce back in the years to come. Unfortunately, it’s becoming evident that the Great Drought of 2012 is not a one-off event in a single heartland nation but rather an inevitable consequence of global warming that is only going to intensify. As a result, we can expect not just more bad years of extreme heat but worse years, hotter and more often, and not just in the United States but globally for the indefinite future. Until recently, most scientists were reluctant to blame particular storms or droughts on global warming. Now, however, a growing number of scientists believe that such links can be demonstrated in certain cases. In one recent study focused on extreme weather events in 2011, for instance, climate specialists at the National Oceanic and Atmospheric Administration (NOAA) and Great Britain’s National Weather Service concluded that human-induced climate change has made intense heat waves of the kind experienced in Texas in 2011 more likely than ever before. Published in the Bulletin of the American Meteorological Society, it reported that global warming had ensured that the incidence of that Texas heat wave was twenty times more likely than it would have been in 1960; similarly, abnormally warm temperatures like those experienced in Britain last November were said to be sixty-two times more likely because of global warming. When we think about climate change (if we think about it at all), we envision rising temperatures, prolonged droughts, freakish storms, hellish wildfires and rising sea levels. Among other things, this will result in damaged infrastructure and diminished food supplies. These are, of course, manifestations of warming in the physical world, not the social world we all inhabit and rely on for so many aspects of our daily well-being and survival. The purely physical effects of climate change will, no doubt, prove catastrophic. But the social effects—including, somewhere down the line, food riots, mass starvation, state collapse, mass migrations and conflicts of every sort, up to and including full-scale war—could prove even more disruptive and deadly. In this, Collins was prescient, even if her specific vision of the violence on which such a world might be organized is fantasy. While we may never see her version of those hunger games, do not doubt that some version of them will come into existence—that, in fact, hunger wars of many sorts will fill our future. These could include any combination or permutation of the deadly riots that led to the 2008 collapse of Haiti’s government, the pitched battles between massed protesters and security forces that engulfed parts of Cairo as the Arab Spring developed, the ethnic struggles over disputed croplands and water sources that have made Darfur a recurring headline of horror in our world, or the inequitable distribution of agricultural land that continues to fuel the insurgency of the Maoist-inspired Naxalites of India. Combine such conflicts with another likelihood: that persistent drought and hunger will force millions of people to abandon their traditional lands and flee to the squalor of shantytowns and expanding slums surrounding large cities, sparking hostility from those already living there. One such eruption, with grisly results, occurred in Johannesburg’s shantytowns in 2008 when desperately poor and hungry migrants from Malawi and Zimbabwe were set upon, beaten and in some cases burned to death by poor South Africans. One terrified Zimbabwean, cowering in a police station from the raging mobs, said she fled her country because “there is no work and no food.” And count on something else: millions more in the coming decades, pressed by disasters ranging from drought and flood to rising sea levels, will try to migrate to other countries, provoking even greater hostility. And that hardly begins to exhaust the possibilities that lie in our hunger-games future. At this point, the focus is understandably on the immediate consequences of the still ongoing Great Drought: dying crops, shrunken harvests and rising food prices. But keep an eye out for the social and political effects that undoubtedly won’t begin to show up here or globally until later this year or 2013. Better than any academic study, these will offer us a hint of what we can expect in the coming decades from a hunger-games world of rising temperatures, persistent droughts, recurring food shortages and billions of famished, desperate people.